§ 210.001 Department of social services to meet needs of homeless, dependent and ..
§ 210.025 Criminal background checks, persons receiving state or federal funds for ..
§ 210.027 Direct payment recipients, child care providers — department’s duties. § 210.040 Blood test results — confidential. § 210.060 Noncompliance a misdemeanor — penalty. § 210.070 Prophylactic eyedrops at birth — objection to, when. § 210.106 Failure to use passenger restraint system not to be basis for civil actions ..
§ 210.109 Child protection system established by children’s division, duties, ..
§ 210.112 Children’s services providers and agencies, contracting with, requirements ..
§ 210.114 Qualified immunity for private contractor, when — exceptions. § 210.118 Court finding of abuse by preponderance of evidence, responsible party to ..
§ 210.122 Voluntary placement agreements, children in state custody solely in need of ..
§ 210.130 Oral reports, when and where made — contents of reports. § 210.146 Evaluation by SAFE CARE provider required, when–referral to juvenile ..
§ 210.150 Confidentiality of reports and records, exceptions — violations, penalty. § 210.153 Child abuse and neglect review board, established, members, duties, ..
§ 210.154 Missouri task force on the prevention of infant abuse and neglect created, ..
§ 210.166 Medical neglect of child, who may bring action — procedure. § 210.167 Report to school district on violations of compulsory school attendance law ..
§ 210.183 Alleged perpetrator to be provided written description of investigation ..
§ 210.187 Child abuse and neglect services and funding, task force on children’s ..
§ 210.196 Hospitals and physicians, rules authorized for protocol and identifying ..
§ 210.199 Licensure through the department of health and senior services required for ..
§ 210.203 Complaints against child care facilities, open records to be kept by ..
§ 210.211 License required — exceptions — disclosure of licensure status, when. § 210.254 Religious organization operating facilities exempt under licensing laws ..
§ 210.256 Violations, penalties — injunction, procedure. § 210.258 Religious organizations operating facility, no interference permitted with ..
§ 210.259 Nonreligious organization’s agreement for child-care facility on property ..
§ 210.275 Child care provided on elementary and secondary school property must comply ..
§ 210.485 Civil liability, for-profit child-placing agency or residential care ..
§ 210.496 Refusal to issue, suspension or revocation of licenses — grounds. § 210.498 Access to records on the suspension or revocation of a foster home license ..
§ 210.506 Rules, procedure — promulgation, persons to be consulted. § 210.511 Division to assist applicants in meeting license requirements and ..
§ 210.516 Exceptions to license requirement — division may not require documentation. § 210.535 Foster care and adoption assistance under federal Social Security Act, ..
§ 210.545 Respite care facilities for foster families — rules and regulations — procedure. § 210.551 Grievance procedure for decisions of division to be developed with ..
§ 210.560 Money held by others for benefit of a child, definitions, liability to the ..
§ 210.564 Citation of law — foster care bill of rights. § 210.617 Missouri state foster care and adoption board created, duties, members, ..
§ 210.630 Definitions — governor’s appointment of administrator authorized. § 210.665 Designated caregiver, court and parties to defer to reasonable decisions of ..
§ 210.675 Permanency plan of another planned permanent living arrangement, prohibited ..
§ 210.822 Presumption of paternity — rebuttal of presumption, standard of proof. § 210.824 Artificial insemination, consent required, duties of physician, effect of ..
§ 210.826 Determination of father and child relationship, who may bring action, when ..
§ 210.828 Statute of limitations, exception — notification form required, when. § 210.830 Parties — guardian ad litem, when appointed. § 210.834 Blood tests — expert defined. § 210.838 Pretrial recommendation — actions, effect of party’s refusal to accept. § 210.841 Judgment or order, contents — amount of support, presumption. 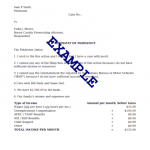 § 210.845 Modification of decree, when — procedure, burden. § 210.846 Hearings and records, confidentiality — inspection allowed, when. § 210.865 Information system, tracking of children by court and by certain state ..
§ 210.870 Juvenile information governance commission created, members, duties, ..
§ 210.915 Departmental collaboration on registry information — rulemaking authority. § 210.933 Registration qualifies as compliance with other background check ..
§ 210.950 Safe place for newborns act — definitions — procedure — immunity from liability. § 210.1007 List of children’s products to be furnished to all child-care facilities by ..
§ 210.1014 Amber alert system oversight committee created, duties, members, ..
§ 210.1030 Task force created, members, duties — termination date.